The Gagne table light box will keep your drawings clean and clear. Purchase now to keep your drawings on track every time. 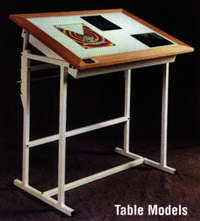 The Gagne Table Light Box is attractive, rugged, and stands up to all your creative and constructive needs. It comes with four tilt adjustments, tilting to 40 degrees, and it includes a 36 by 48 inch viewing area. The table includes four lamps so illumination is even over the complete table. Hot spot aren't an issue with these lamps giving even, full lighting. Assembly is very easy, and the solid oak frame stands up to pressure every time. Use the product with or without the base; simply remove two bolts and you have a legless, movable table top. This table, with its even lighting, versatility, stability and ability to deliver every time, is a must have for anyone who needs an extra light underneath their blueprints or creations.